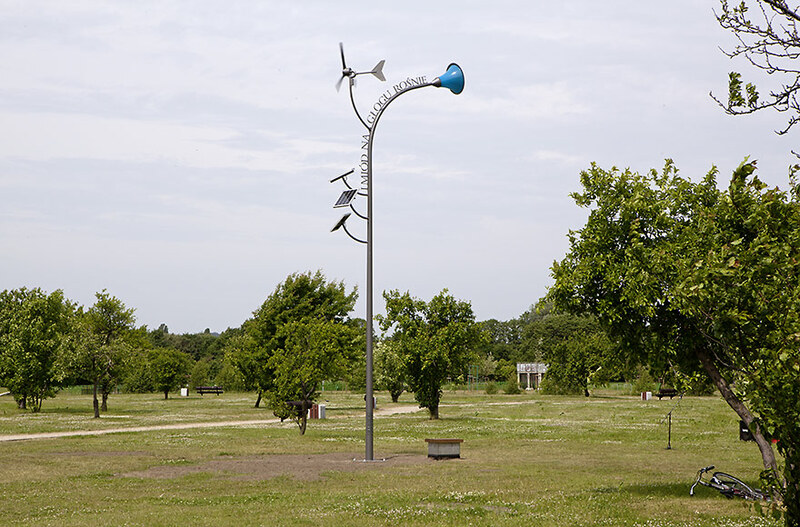 Real­ized in 2013 in the park Nadmorski in Gdansk/PL within the South Baltic Program, Wind Energy in the Baltic Sea Region 2 coor­di­nated by theElec­trotech­nical Insti­tute Gdansk Branch. 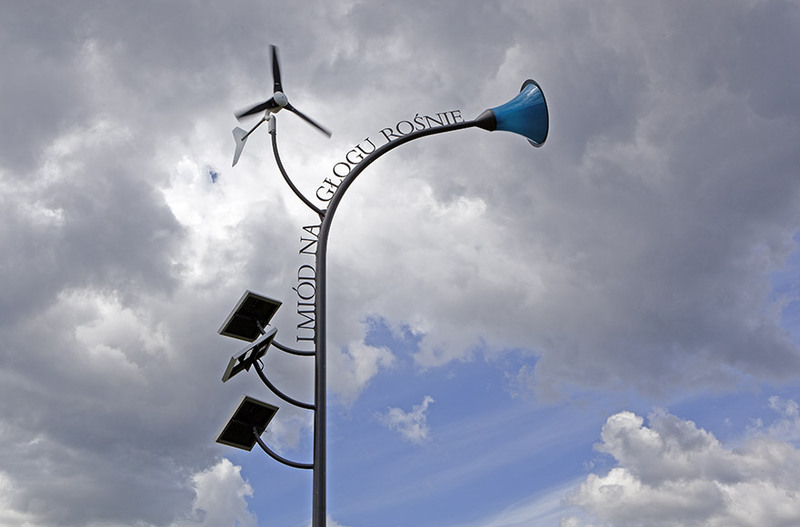 An enlarged copy of the street lamps of the Park with cut out char­ac­ters running along the slim mast, bends down like a flower with a too heavy head. At a height of 80 cm there is a small hemi­sphere on the mast, a metal bulb, that is heated in winter time to warm ones hands. There is a rotating wind turbine on top of the mast and three solar panels fixed to it. The metal char­ac­ters form the short sentence: I MIÓD NA GŁOGU ROŚNIE (and honey upon hawthorn grows). The sentence comes from a song: “A proper new Ballet called the summons to Newe England” describing the plen­ty­tude of New England in North America in the migra­tion era at around 1660. The full text is: THERE MILK FROM SPRINGS, LIKE RIVERS FLOWS / AND HONEY UPON HAWTHORN GROWS / HEMP, WOOL AND FLAX THERE GROWS ON TREES / THE MOULD IS FLAT, IT CUTS LIKE CHEESE / ALL FRUITS AND HERBS SPRING IN THE FIELDS / TOBACCO IS GOOD PLENTY YIELDS / NO DISCIPLINE SHALL THERE BE USED: THE LAW OF NATURE THEY HAVE CHOOSED. It describes a promised land, whose terrain is ideal, it´s grounds are always fruitful and where nature produces auto­mat­i­cally. 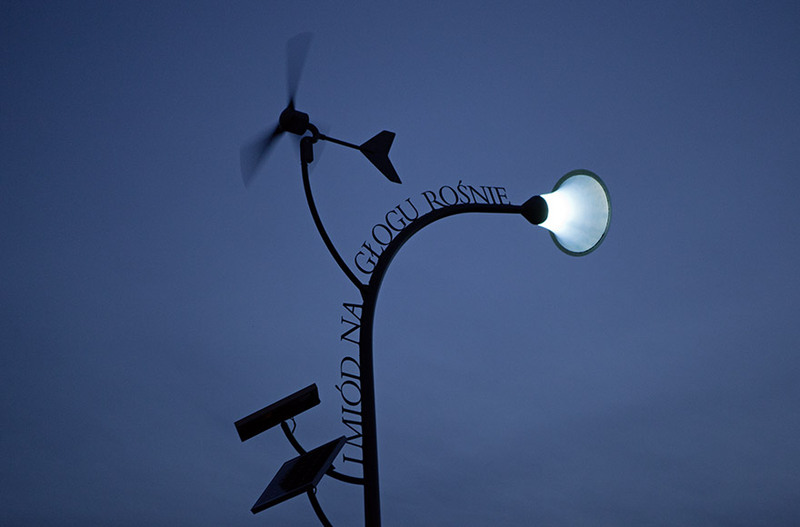 The sculp­ture is tech­nical construc­tion, that from wind and weather produces light and warmth.